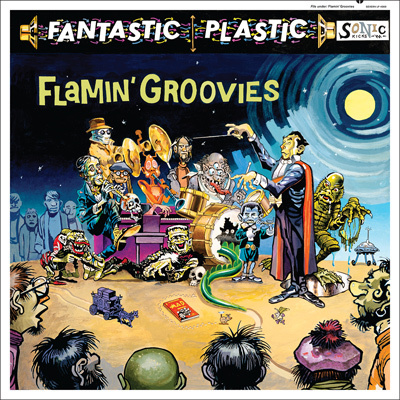 Rejoice, rock ’n’ rollers: San Francisco’s Flamin’ Groovies are returning with Fantastic Plastic, an all-new album of high-energy, pop-inflected original songs that bring together the band’s prime movers of the ’70s, singers-guitarists-songwriters Cyril Jordan and Chris Wilson for the first time in 38 years. The set reconvenes the driving forces of the Groovies’ storied Sire Records lineup, which cut the widely admired, warmly remembered magnum opus Shake Some Action (1976) and its follow-ups Flamin’ Groovies Now (1978) and Jumpin’ in the Night (1979), which fused the band’s ‘60s-bred rock classicism with the new-look voltage of punk rock. Jordan and Wilson parted company in 1980, and both men went on to enduring work as keepers of the rock ’n’ roll flame — the former with the Groovies and his successor act, Magic Christian, the latter with England’s Barracudas and his own solo albums. Fantastic Plastic was recorded mainly with founding Groovies bassist George Alexander and the band’s latter-day drummer Victor Penalosa, with assistance from members of the Fabulous Thunderbirds; the instrumental “I’d Rather Spend My Time With You” was cut with bassist and noted producer-archivist Alec Palao and Tubes drummer Prairie Prince. The album is a storming collection of top-flight originals — including the 2016 single “Crazy Macy” and the stinging new lead-off track “What the Hell’s Going On” — that blends classicist touches of the Beatles, Stones, and Byrds with the group’s immediately recognizable sound. The Flamin’ Groovies’ forthcoming summer/fall 2017 tour dates on the East Coast, in Europe, and in the Midwest will introduce the band’s new rhythm section: bassist and well-known Northern California power-pop singer-songwriter Chris von Sneidern and drummer Tony Sales, son of the like-named veteran of David Bowie and Iggy Pop’s bands. Their all new album of all new hits! Some said it couldn’t really be happening; that it was just hype. And the fabulous Flamin’ Groovies proved them wrong. Others said they couldn’t last more than a month; that it was a retro act. The Flamin’ Groovies proved them wrong too. Then, all of a sudden people began to wonder if all the Groovies’ fans worldwide hadn’t really discovered something after all. But you, the Groovies’ fans knew all along. You knew that the Groovies really do have a style and a sound that rocks out. And it’s simply because you like them (and they like you) that this Fantastic Plastic CD has happened. And now here’s what you’ve all been waiting for—a new Groovies album with all new Groovies songs, most of them, like End of the World; Crazy Macy; Cryin Shame, She Loves Me, What the Hell’s Goin’ On, and others, composed by that hit song-writing team of Cyril Jordan and Chris Wilson.